Black holes get a bad rap in popular culture for swallowing everything in their environments. In reality, stars, gas and dust can orbit black holes for long periods of time, until a major disruption pushes the material in. A merger of two galaxies is one such disruption. As the galaxies combine and their central black holes approach each other, gas and dust in the vicinity are pushed onto their respective black holes. An enormous amount of high-energy radiation is released as material spirals rapidly toward the hungry black hole, which becomes what astronomers call an active galactic nucleus (AGN). A study using NASA's NuSTAR telescope shows that in the late stages of galaxy mergers, so much gas and dust falls toward a black hole that the extremely bright AGN is enshrouded. The combined effect of the gravity of the two galaxies slows the rotational speeds of gas and dust that would otherwise be orbiting freely. This loss of energy makes the material fall onto the black hole. "The further along the merger is, the more enshrouded the AGN will be," said Claudio Ricci, lead author of the study published in the Monthly Notices Royal Astronomical Society. "Galaxies that are far along in the merging process are completely covered in a cocoon of gas and dust." Ricci and colleagues observed the penetrating high-energy X-ray emission from 52 galaxies. About half of them were in the later stages of merging. Because NuSTAR is very sensitive to detecting the highest-energy X-rays, it was critical in establishing how much light escapes the sphere of gas and dust covering an AGN. The study was published in the Monthly Notices of the Royal Astronomical Society. Researchers compared NuSTAR observations of the galaxies with data from NASA's Swift and Chandra and ESA's XMM-Newton observatories, which look at lower energy components of the X-ray spectrum. If high-energy X-rays are detected from a galaxy, but low-energy X-rays are not, that is a sign that an AGN is heavily obscured. 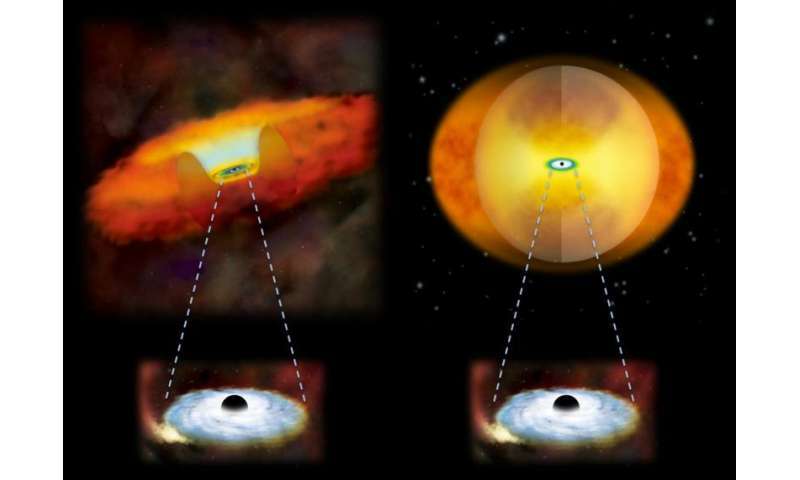 The study helps confirm the longstanding idea that an AGN's black hole does most of its eating while enshrouded during the late stages of a merger. "A supermassive black hole grows rapidly during these mergers," Ricci said. "The results further our understanding of the mysterious origins of the relationship between a black hole and its host galaxy." Merger maniacs gone wild with speculation. After all, they cannot conceive how else a central core star could grow rapidly, other than by merger with another supermassive body. However, in SQK, the internal rate of growth itself grows exponentially with growing mass. And as it grows, it ejects more and more gas therefrom, enshrouding the core star itself. At some point, I speculate that the shrouded core becomes so active that it blows away the surrounding shroud, and becomes exposed as a very special type of AGN. Ironic that you constantly complain about speculation from main stream science, but then actually use the word speculate in your explanation of your MODEL and see no issue with it. well done. It's an interesting conundrum. The discovery in this article may provide an explanation: the quasar proximity effect may be shrouded, and/or the SMBH accretion may not be accompanied by the jets of an AGN, while it is gaining most of its mass during mergers. It's rare that two articles combine so neatly to form both a puzzle and its potential solution. Thanks for the open access link, @RNP; perhaps you can take a look at these two articles and provide some, pardon the pun, illuminating commentary.